Why did the Ball family hire a 28-year-old rookie agent with no active NBA clients to represent Lonzo? Once you get to know Harrison Gaines you'll figure out why. In the eye of the draft hurricane, the NBA's new first family eagerly awaits Adam Silver’s announcement: With the second pick, the Los Angeles Lakers select Lonzo Ball! LaVar beams, three gold Bs running down his black tie. His three boys, draped in custom-made ensembles, brace for a choreography of secret handshakes. There’s a man standing just behind the green room table, his burgundy suit perfectly pressed, wearing a serene smile. The selection is as much a culmination of his own grind as is the 6’6" point guard with that innate passing gene. 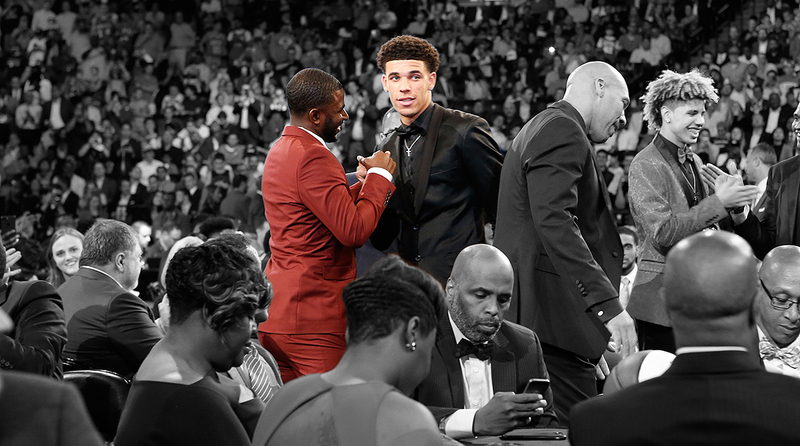 His identity became news in early April, when Lonzo officially entered the draft and signed with an agent. “How did he beat out the [Jeff] Schwartzs, the Wasserman Group, Billy Duffy, all of the known guys will all of the major clients?” wonders Sonny Vaccaro, the legendary former sneaker executive. He was virtually unknown amongst NBA personnel. “In our front office, everyone was like, ‘Who the hell is this guy?’” says Warriors assistant GM Kirk Lacob. With LaVar leaving so little about his family to the public’s imagination, one essential question remains: Who is Harrison Gaines? At first, Harrison Gaines wanted to be Michael Jordan. He was gifted Jordan’s Come Fly With Me on VHS as a three-year-old. Gaines studied the tape, mirroring every acrobatic move His Airness performed on the plastic, miniature hoop in his family’s Victorville, Calif. living room. He could lose himself in the exercise for hours. “That was like the best babysitter,” says his mother Stephanie. Of course, Gaines took it seriously. In grade school, he skipped lunch so he could prolong recess and created a schoolyard league, printing out team schedules and everything. In middle school, he recruited a towering football player named Koray Keys to discover the magical, orange ball. The team needed a paint presence, so every night that fall, he trained Keys on the hoop in the family’s cul de sac. Sure enough, they morphed into a dynamic inside-out tandem and captured a championship that winter. 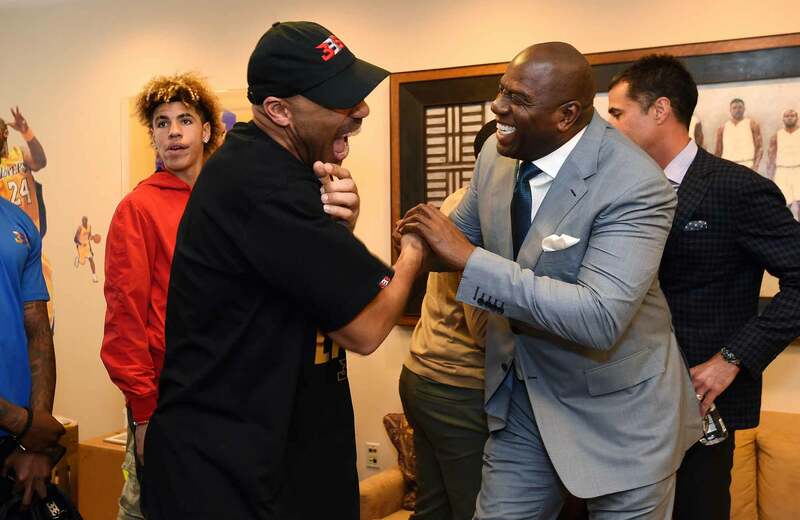 He infused that east coast grit into the vaunted Inland Empire AAU program, which had already produced first-round picks Antoine Wright and Ed Gray. Gaines morphed into an attacking point guard, knifing into the teeth of opposing defenses, capable of finishing amongst the trees or distributing to open shooters. He matched up against Darren Collison on the daily and sparred with Darren Moore, later known as UC Irvine’s Spiderman. When he wasn’t honing his craft, Gaines sharpened his mind helping coach his brother Silas’s 12U team. “He has a very high basketball IQ,” says Inland coach Elvert Perry. After one tournament, Gaines reported back to Benjamin in New York. The team had won. He played alright. “He just ripped into me,” Gaines says. Alright was no longer acceptable. Elite college players didn’t tolerate anything short of superlative. “You have to kill,” Gaines internalized. Benjamin’s advice extended beyond the court. He urged Gaines to listen to classical music the night before his SATs to stimulate brain function. Alongside future Grizzlies draft pick Jamaal Franklin, Gaines emerged as one of the most decorated players in Serrano High School history—the school later retired his jersey—and The University of Pennsylvania expressed early interest. Stanford and Oregon also called; Colorado State and Boise State offered. But Gaines found himself housed in the Inn at Penn for an official visit, allured by the Quakers’ three-straight Ivy League titles, intoxicated by the Palestra’s hallowed hardwood. “It was historic,” Gaines says. The departure of twice-defending Ivy League Player of the Year Ibrahim Jaaber also presented an opportunity to clasp the keys to the program. 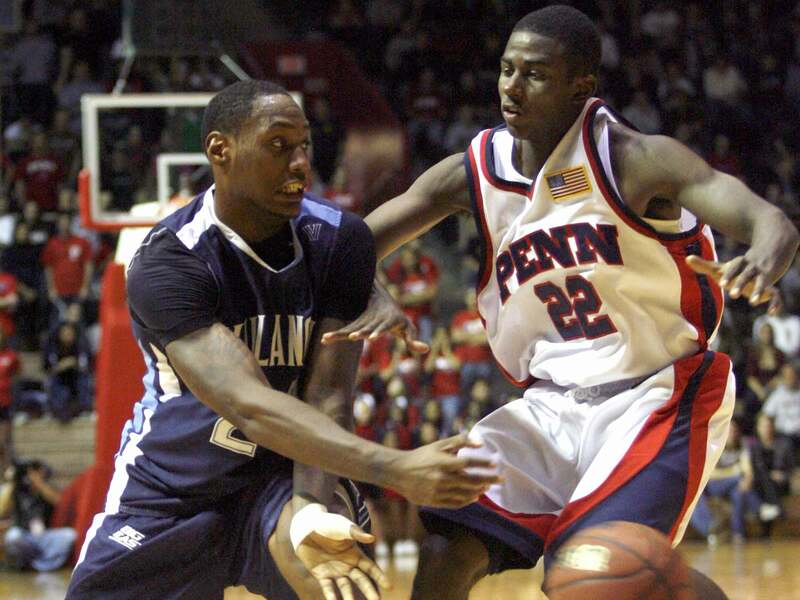 “Harrison was the guy,” says Perry Bromwell, a former Penn assistant. As the first winter winds whistled across Philadelphia, Gaines found his footing at Penn, bundling under a comically large coat and hat. He led the Ivy league in assist to turnover ratio as a freshman in 2007-08. Meanwhile, brilliant classmates were accepting internships at Goldman Sachs. “When you’re around them everyday,” Gaines says. “It raises your level.” Thoughts of life-after-basketball began to creep in. At his father’s suggestion, player representation had long been appealing. Gaines dipped into David Falk’s and Drew Rosenhaus’s books, jotting thoughts into the yellow notepad app on his iPhone. Zack Rosen arrived on campus the following fall. Glen Miller’s staff envisioned a dynamic, dual ball handler backcourt, years before the craze permeated the NBA. Gaines harbored a score-first mentality. Miller found his pure floor general in the redheaded guard from Jersey. “For reasons I’m not too sure about to this day, they didn’t stay in the program as a tandem,” Bromwell says. Moving off the ball proved a challenging adjustment. Gaines finished second on the team in scoring (9.9 PPG) for the season, but bounced in and out of the starting lineup. It was clear: Miller favored Rosen. And NBA scouts would find little intriguing about Gaines, a 6’0" two-guard. Gaines needed the ball back in his hands. He needed to kill. UC Riverside appeared to present that opportunity. So Gaines migrated back west, 30 minutes from his parents’ house, back in the state he once torched as a point guard prodigy. Riverside didn’t prove to be the haven he sought. Gaines sat out the 2009-10 season due to NCAA transfer rules and never managed to reclaim lead ball handling duties over the next two years. Even still, he found a role. “He showed the young guys at the time that you have to put the work in,” says Von Webb, a former Riverside assistant. During Gaines’s senior year, Webb walked back to the coaches’ offices late one evening. He heard a ball bouncing on the practice court and curiously poked his head inside the room. It was Gaines. Two night later, a dribble reverberated throughout the gym once more. “After about three or four times, I quit looking because I knew who it was,” Webb says. Gaines pounded the rock until its final bounce. The fire was fueled. He enrolled in the Thomas Jefferson School of Law’s Center for Sports Law and Policy. Gaines studied during the week and used his refund checks to attend AAU tournaments and grassroots events on weekends, creating a rolodex of contacts. “Harrison was so advanced,” says Jeremy Evans, the sports program’s director. In time, he started a dialogue with Brian Elfus and secured an internship at Impact Sports Management, running the agency’s social media. Shortly after, Franklin, his old high school teammate, was blowing up at San Diego State. When Gaines referred the versatile swingman to Impact, he entrenched himself in the agency’s pre-draft process. He spent sunrise to sunset at Impact Basketball—the famed gym, unaffiliated with the agency—driving a van of draft prospects to and from the facility. He rebounded whenever a player wanted to hoist late night shots. He fed their shooting pockets during pro day drills, like he was back running Penn’s offense as an 18-year-old. All the while, a legion of who’s who NBA figures filtered in and out of the complex. Every conversation unveiled pearls of wisdom. The yellow notepad on his phone unfurled even longer. At NBA Summer League in 2014, Gaines approached everyone wearing polos with NBA team logos stitched onto the breastplate. There was a young man around his age sitting in the Thomas & Mack Center, his sandy hair nearly matching the Warriors’ gold on his shirt. “Hi, my name is Harrison Gaines…” the aspiring agent began. Lacob flashed back to those Stanford camps over a decade in the rearview. The Harrison Gaines? The premier point guard prospect he had envied? “How about this unbelievable line of events?” Lacob says. He invited Gaines to join a late-night pick-up run, consisting of two dozen league executives and former players. The notepad expanded even more, especially when Impact later tasked him with crunching the numbers on Kawhi Leonard’s impending contract extension, facing a highly anticipated salary cap surge. Later that year, Gaines joined a contact at a Southern California AAU Tournament. He was sitting next to a boisterous couple and introduced Gaines to LaVar and Tina Ball. They crossed paths at another event. Then another. A relationship spawned. “I took a liking to the family, to the boys, their dynamic was unique,” Gaines said. Soon enough, he was bringing his mother along to watch Lonzo, LiAngelo and LaMelo run opponents ragged and fling three-pointers from the parking lot. Just before Silver announced the 76ers were on the clock with the first pick, Lakers GM Rob Pelinka texted Gaines, inquiring about the quality of his cell phone reception. He had adequate bars, but Gaines wanted to know, “How we looking?” Minutes before the No. 2 pick, L.A. had yet to commit to the Chino Hills product scouts compared to Jason Kidd. Still, a response never buzzed his cell. The phone with the interminable notepad. The phone that front office executives are now calling, fully aware of its owner’s name.